The Moorings Winding Hole is a minor waterways place minor waterways place place on the waterways major waterways place village town city on the Leeds and Liverpool Canal (Main Line - Wigan to Leeds) between Saltaire Road Bridge No 207A (Saltaire) (4 miles and 5 furlongs and 5 locks to the west) and Armley Mills Bridge No 225 (7 miles and 2¼ furlongs and 7 locks to the east). The nearest place in the direction of Saltaire Road Bridge No 207A is Milman Swing Bridge No 214; ¾ furlongs away. The nearest place in the direction of Armley Mills Bridge No 225 is Apperley Bridge Marina; ½ furlongs away. Apperley Bridge — 632 yards to the northeast. Westfield Lane, Bradford, BD10 8PY — 1586 yards to the west. 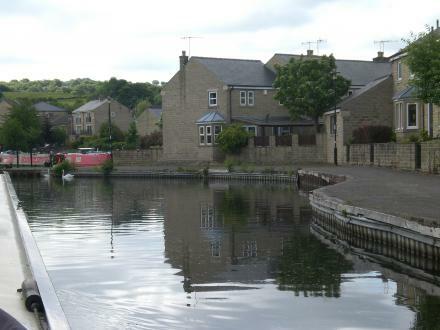 Apperley Bridge Marina, Waterfront Mews, Apperley Bridge, BD10 0UR — 107 yards to the southeast. Bradford — 1540 yards to the west. 101 Town Lane, Bradford, BD10 8LP — 1538 yards to the west. The House Of Beauty 101 Town Lane, Idle, Bradford, BD10 8LP — 1559 yards to the west. Bradford — 1347 yards to the northeast. Albion Mills, Albion Road, Bradford, BD10 9TQ — 624 yards to the southwest. Waterfront Mews, Bradford, BD10 0UR — 101 yards to the southeast. Apperley Bridge — 265 yards to the southwest. 8 Sedbergh Close, Bradford, BD10 9FH — 1171 yards to the southwest. Woodlands Close, Bradford, BD10 0 — 1103 yards to the northeast. 109 WHITFIELD MILL,, Bradford, BD10 0LP — 233 yards to the southeast. Woodlands Drive, Bradford, BD10 0 — 758 yards to the northeast. 927-929 Harrogate Rd, Bradford, BD10 0RB — 591 yards to the south. 3 Averingcliffe Road, Bradford, BD10 9HQ — 1163 yards to the south. 4 bradford road, Bradford, BD10 9PP — 1345 yards to the west. Bradford — 1129 yards to the west. Idle — 1230 yards to the northwest. Apperley Bridge — 809 yards to the east. The Little Theatre, Malt Shovel Yard, Westfield Lane, Bradford , BD108QB — 1509 yards to the west. Bradford — 1328 yards to the south. High Street, Bradford, BD6 1QR — 1435 yards to the west. Bradford, BD10 0AX — 182 yards to the north. Bradford — 185 yards to the southeast. 2 The Covet, Bradford, BD10 9TH — 376 yards to the southwest. Harehill Road, Bradford, BD10 8 — 1465 yards to the northwest. Yew Tree House, Idle, Bradford, Bradford, BD10 9UL — 1313 yards to the west. Leeds — 1620 yards to the south. Bradford — 1178 yards to the south. Bradford — 1211 yards to the southwest. Bradford — 1135 yards to the west. Bradford — 989 yards to the south. Leeds Road, Idle, Bradford, BD109 — 1204 yards to the northwest. bearBOATING Ltd, Apperley Bridge, BD10 0UR — 101 yards to the southeast. 32 Town Lane,BD10 8NS, Idle — 1437 yards to the west. Leeds, BD10 — 1463 yards to the west. Bradford — 714 yards to the south. 616 yards to the east.